For over two decades now, PHP has solidified a reputation as a solid programming language for the back-end. PHP programmer salary expenses tend to be lower than comparable choices for back-end programming. In addition, multiple, free, open sources choices for web frameworks make it an ideal language for developers. The language comes with lower hiring costs when compared to similar programming languages. For instance, in the U.S., PHP programmer salary is among the lowest for programming languages. The 2017 StackOverflow Developer survey found that PHP did not make the list of most costly programming languages worldwide. When the data focuses on the U.S. only, the programming language was tied in second to the last place, ahead of only VB.NET. The following table shows the U.S. figures for a group of selected programming languages. The data indicate that programmers using the language cost less to find and hire. This is partly explained by there being higher PHP developer numbers around the world. There are good reasons why the language has become a default choice for many teams. Among its many advantages, the language has distinguished itself as a low learning curve language. Unlike languages like Java or C#, which take some major setting up, installing PHP is fast. Getting a page up and running with the technology is a five-minute process as laid out in the language manual. In addition, the language brings these great advantages over most programming languages: * Easy to learn - it is a beginner-friendly programming language. This programming language has a friendly syntax and semantics that look relatable to a first-time back-end programmer. This is in sharp contrast to languages like Java or C# .NET, which require significant ramp up to even configure on a local machine. * Dynamic, enjoyable to work with - programmers tend to be split between those who like dynamic, scripted languages like PHP, and those who prefer static, compiled languages like C++. Working with a compiler can catch syntax errors and other compile-time errors. However, dynamic languages involve less process and tedium. There is no need to link object files before the programmer can run the program. As a result, dynamic languages offer an often more enjoyable working experience. * Popular with programmers - For 2017, it was the 10th most popular programming language according to the TIOBE Index. The index tracks the popularity of programming languages and assigns a ranking based on indicators such as course availability. Given that it’s so popular, you might be wondering what is at the heart of the language that has guaranteed its success. The language was created in 1994 by Rasmus Lerdorf. Its main implementation was coded in C. Its syntax, according to NuSphere’s History of PHP, was taken from C, Perl and Java. It was designed to be easily embedded into web pages. This feature has been a big factor in the language’s success since it interoperated easily with web technologies. While PHP is a powerful web programming language, coding plain PHP can get unwieldy when your application grows. 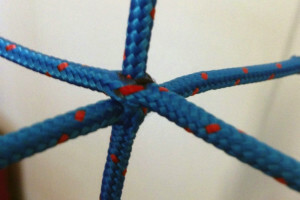 As a result, you will want to use a framework to structure your back-end code. Web frameworks make your PHP code easy to maintain. Adding new features or correcting bugs in the code turns into a low-cost issue when using a well-designed framework. In addition, programmers find it easier to learn a new codebase if it conforms to framework conventions. This tends to raise productivity for your technical team members. When selecting the best PHP framework for a software project, it helps to choose from a highly rated open source framework. Developing with a major framework gives you advantages like availability of code libraries, as well as the talent that knows those libraries. Below, we give you the 5 most popular PHP frameworks according to Github stars data for January 2018. 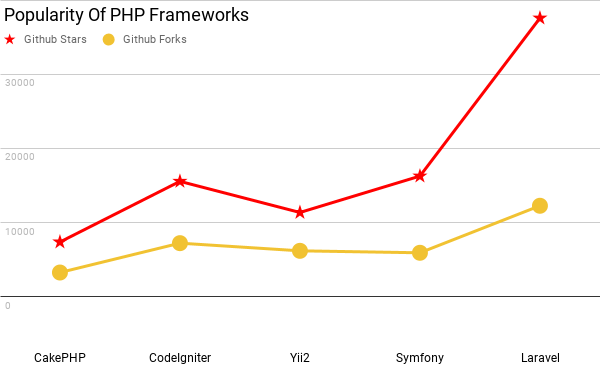 Looking at the chart gives us a clear picture of the dominance of Laravel in particular, followed by CodeIgniter, Symfony and Yii are popular as well, but lag behind the leaders. PHP share of all websites on the internet is impressive when compared to just about any programming language. 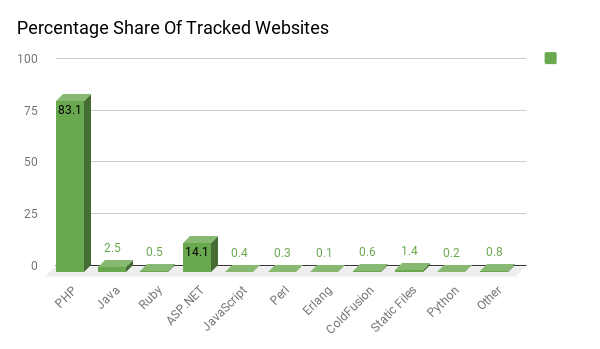 We charted data from W3Techs for the programming languages used on websites. As can be seen from the following market share for websites, PHP alone dwarfs all other programming languages combined. This achievement is thanks to the low-cost nature of coding and deploying a website running PHP. Web host companies have long treated the language as a first-class citizen. This and other factors have contributed to the out-performance of the language on the web. The leadership position of PHP is unlikely to be threatened anytime soon given the ease with which young programmers can pick up the language. Continued investment into the language by companies and university education programs indicate a rosy future for PHP usage in back-end development. Projects that pick the language will continue to enjoy massive advantages. These include a large population of active programmers and reference materials. The high popularity of the language also provides incentives for programmers to learn PHP. Finding a web developer for your project will, therefore, be easier than if you choose a more obscure language. In addition, the multitude of open source libraries and frameworks make it easier to go quickly from idea to complete application.